Having a baby is a special time in anyone’s life. When it is your first baby, there is an extra charm to it. A couple of weekend’s ago, I was showered with so much love at our baby shower hosted by my sister and mother. Not only does a baby shower assist you and the father-to-be with many much-needed items, but it confirms the love, encouragement, and support that your little bundle of joy will receive when he or she enters this world. 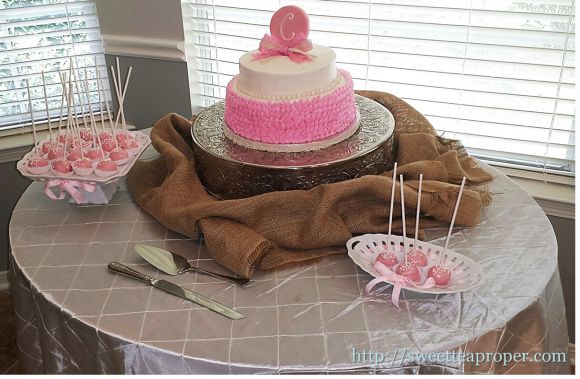 The baby shower was vintage-inspired with elements of lace and burlap. 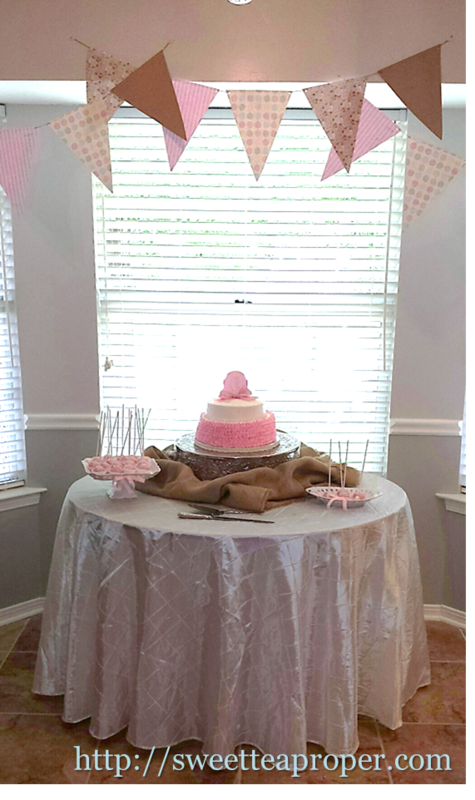 Since our little bundle of joy is a girl, the color scheme for the baby shower was predominantly pink with touches of white, ivory, and brown. The baby shower was held at my and Mr. P’s house. Although my sister originally opposed this idea, in hindsight, I think it worked out wonderfully. My sister, mom, and mother-in-law did the bulk of the setting up, moved all of Cecilia’s new things into her nursery, and had the house cleaned within an hour of the last guest leaving. Since all I was expected to do was show up, it made it quite stress-free for me. As with any shower or party, the excitement begins with the arrival of the invitation. 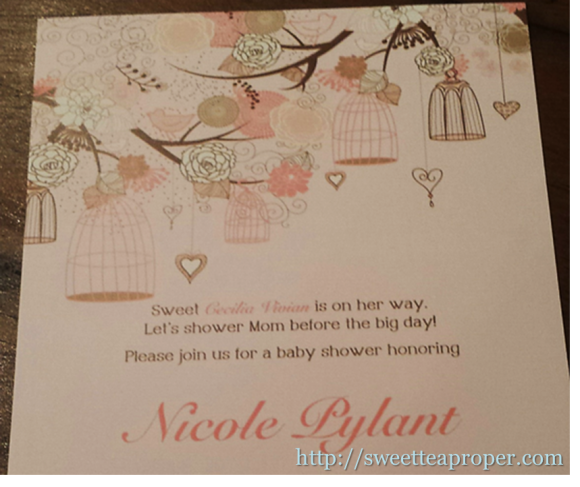 The rights to these pink vintage birdcage baby shower invitations were purchased from a seller on Etsy and printed locally. 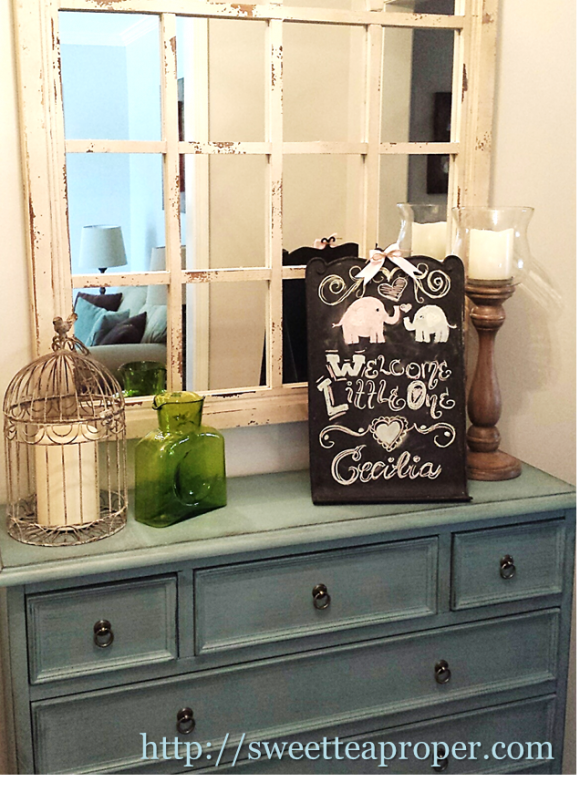 When guests arrived, the foyer was setup to greet them with a chalkboard sign lovingly drawn by my dear friend Tina. She and I both share a love of little elephants which seems to be very popular in the baby circuit right now. 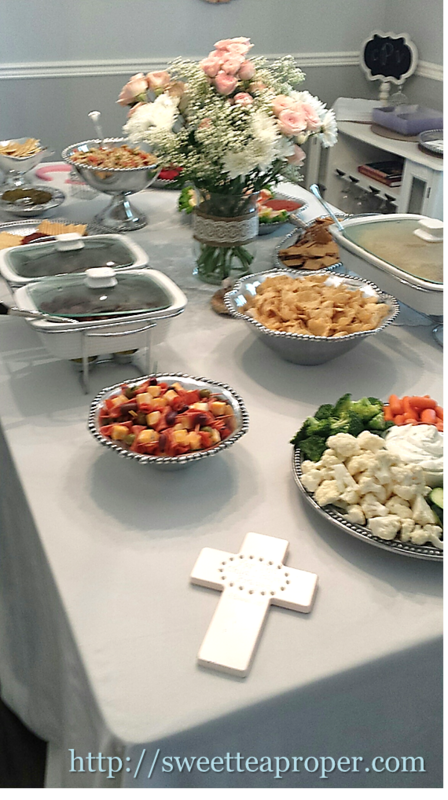 The food was displayed on platters in the dining room. The chairs were moved out of the dining room to allow guests full circular access around the table. A lovely floral arrangement with baby’s breath, roses, and mums served as the centerpiece for the table. A burlap ribbon with a crocheted lace border (made by my sister) wrapped the middle of the vase. It was a lot of food and so good! I had my mom bag up about a day’s worth and put it in our refrigerator. We finished it before the next morning! Mr. P was disappointed that I didn’t insist on more. 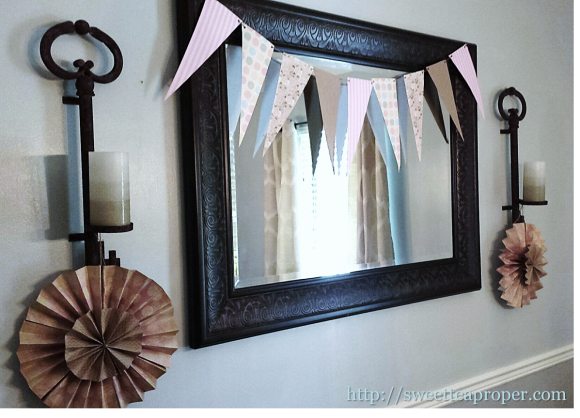 On the main wall in the dining room, a vintage paper banner was draped across the mirror. These are so easy to make and give a big impact. Using twine gives it a rustic feel and also helps each section stay in place. Paper rosettes (another great and easy DIY decoration) were hung at the base of the key candle holders. The cake table was draped with an ivory pintucked linen. The cake base was from our wedding (as it turns out, not selling it turned out to be a good thing). My sister pulled the burlap theme into the breakfast nook by surrounding the cake base with a burlap skirting. Using the same vintage-inspired paper, three additional paper banners were hung over the cake table and attached to the wall using sticky putty. The two-tiered baby shower cake had a pink ruffled bottom with a white top and chocolate “C” monogram to celebrate our sweet Cecilia. It was made by Karen at Kandies by Karen. She also made the cake pops on the table. What is missing from the table is the delicious banana pudding made by my sister. As I stated earlier, there was SO much food and by the end of the shower there was just as much pudding missing as cake! The den was where the present opening took place. 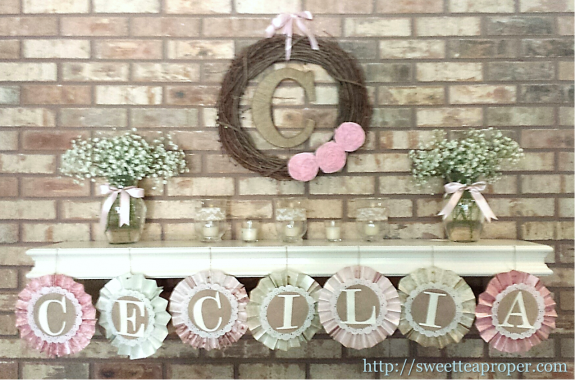 A rustic wreath with a twine wrapped “C” and pink rosettes was hung on the brick fireplace. On each side of the mantle stood a vase wrapped in burlap and ribbon and filled with baby’s breath. In between the vases were candle holders wrapped in burlap and lace. Vintage paper rosettes spelling out C-E-C-I-L-I-A hung down below, tying it all together. We received so many nice things and well wishes. It truly is special to join the other ladies in this journey called motherhood. Each piece of advice, encouragement, and love is something that I will treasure. I cannot describe how much it means to me to have such wonderful ladies surround me that I get to call “family and friends”. We are truly blessed.